True confession time - I really don't watch TV. Some Ugly Betty, a little Entourage, Weeds, and, well, that's about it. I've rented some My Name is Earl and liked it. it's not that I hate TV, I just don't have reception and instead spend time reading and going online. That means that despite the many gossip blogs I read and my People magazine subscription, there are a ton of modern celebrities whose names mean nothing to me. Last week, my friends laughed at me when I confessed that I didn't really know who Clay Aiken was. Anyway, this post features two celebrities. This photo of Andrea Bowen of Desperate Housewives was featured on Just Jared. 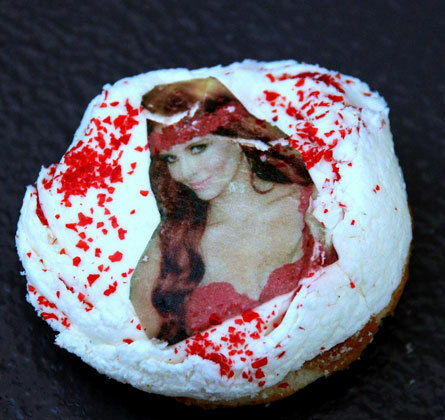 It features her with a Crumbs' cosmpolitan cupcake. Again, no idea (though I have seen one episode of Desperate Housewives, so I'm not 100% clueless, just, maybe, 98%). So this brings me to a question...what celebrity would you like to see celebrate with cupcakes? Who should have their own custom cupcake, and what would the flavor(s) be? ~Milk chocolate icing piped really SWIRLY-like to resemble his (ABSOLUTELY ADORABLE)hair. Dwayne Johnston - a Rockcake! Chocolate cake with a mocha mascarpone cream topping and ... something molten in the middle. i second the johnny depp cupcake!